With one ex-Eagle already confirmed, director of rugby Mark Aston has hinted James Davey won’t be the only former star to return to his flock next season. 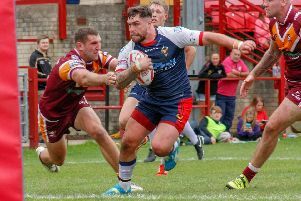 The 29-year-old became the first name announced for Aston’s new look squad for 2019, as the long-serving coach plots sweeping changes in an attempt to make his side more competitive next term. With Davey rejoining after a spell with Batley, Aston has suggested there could be more former heroes returning to the Steel City, as he attempts to recreate the dressing room atmosphere which he says gave the Eagles some of their most successful times in their modern guise. “There are potentially a few more players who have played with me before coming back,” he told The Star. There have been times this season where Aston has questioned his side’s mental fortitude, with the 50-year-old keen to add experienced players who know the club to help mould a promising crop of youngsters who he has high hopes for in the future. With the club’s off the field situation better than it has been in recent seasons, Aston is closer to the head of the queue after being forced to feed off scraps late on when most clubs had completed their recruitment last year. Aston says he has several more players in the bag for next season, with some of those names likely to have worn the red and gold previously. “The recruitment drive is going really well and I can't wait for next year already. I can't wait for pre-season to start,” Aston added. “We have kids here before who have gone on to other clubs, they are great kids. We know why we lost them, we didn't want them to go but at the time we made the decision to go full-time and some of these lads couldn't make that commitment, which we understood. We need good people around us to become successful and that can't come quick enough." 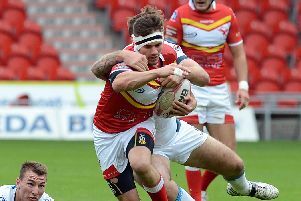 The outgoings have also started with Jon Magrin returning to Bradford Bulls and Iliess Macani joining Batley for 2019.